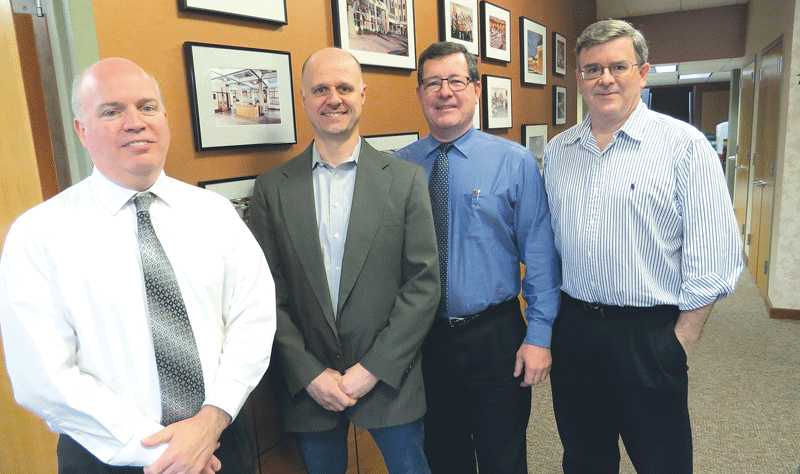 From left, the principals at Caolo & Bieniek Associates, James Hanifan, Bert Gardner, Curtis Edgin, and John MacMillan. That’s the phrase summoned by Curtis Edgin when he was asked to identify the primary advantage gained through the union of two architecture firms, Caolo & Bieniek Associates (CBA), which he serves as a principal, and Reinhardt Associates, a long-time competitor. He would go on at length in his answer and use a number of different words and phrases, but the term ‘horsepower’ probably summed it up best. He used it to describe everything the union brings to the table: experience, client bases, contacts within both the public and private sectors, and simple know-how — about this business, this market, and much more. It’s a case of simple addition by … addition, said Edgin, noting that this new, larger firm has a bigger engine, if you will, one capable of fueling additional growth. And by engine, he meant people in particular. John MacMillan, formerly president at Reinhardt Associates and now a partner with Caolo & Bieniek, agreed. With a larger team, he noted, the firm brings more experience to the forefront, especially in several specialty areas shared by CBA and Reinhardt, including schools, public-safety complexes, senior centers, and others. Both MacMillan and Edgin agreed that, because of these shared specialities, talents, and especially relationships forged through decades of work with common institutions, cities, and towns, the union of the companies made sense on a number of levels. For this issue and its focus on construction, BusinessWest takes an in-depth look at the union of the two firms and what this additional horsepower means in terms of growth potential. The walls of an architecture firm’s lobby — and this case, the conference room as well — usually tell a story. It’s told through photographs and renderings of projects that have made it from the drawing board to reality — and the firm’s portfolio as well. The walls within Caolo & Bieniek’s offices in Chicopee relate such a story, with images of schools, public-safety complexes, senior centers, bank branches, municipal offices, libraries, and more. Actually, the walls and the images tell two stories — well, sort of. Caolo & Bieniek’s deep portfolio and wide diversity of projects mirror the body of work assembled by Reinhardt Associates. 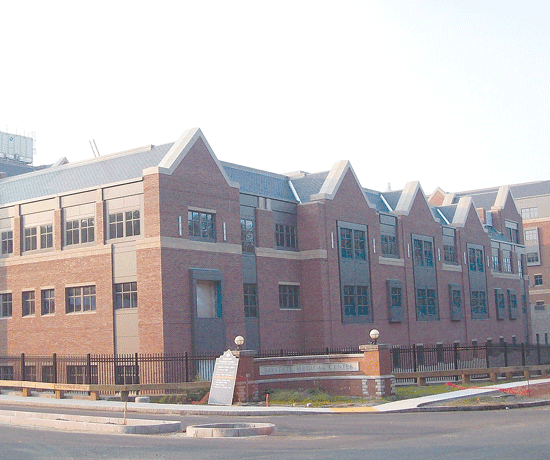 The new Easthampton High School is one of many education-sector projects in the Caolo & Bieniek portfolio. Talks began sometime last fall, and they culminated in an agreement earlier this year that saw MacMillan and another architect join the Caolo & Bieniek firm. As noted, the union gives the firm more horsepower at a time when it is certainly needed. Indeed, while the economy is relatively strong and work somewhat plentiful — in both the public and private sectors — competition for that work is as keen as ever. And it’s coming from all points on the compass, especially the east, said MacMillan, where a number of Boston-area firms are becoming more aggressive in their pursuit of work in the 413 area code. Overall, the firm intends to use its additional horsepower and existing strengths and contacts to generate more growth, said Edgin. One of these strengths is simple diversity, a trait that helps keep operations afloat when one segment of the industry falls off, as school construction did years ago when the state cut back on funding. But it also helps when times are better and there are a number of projects to bid on. And the company’s portfolio — not to mention those walls in the lobby and conference room — reveal that it has undertaken everything from restoration work on the clock tower of the Old Chapel at UMass Amherst to the new transit center in downtown Westfield; from a host of police and fire stations to school projects across the region and well outside it. Roughly 75% of the joined firms’ portfolios fall in the public-sector realm, said Edgin, adding that schools are a big component of this work, and projects run the gamut from preschool to colleges and universities. 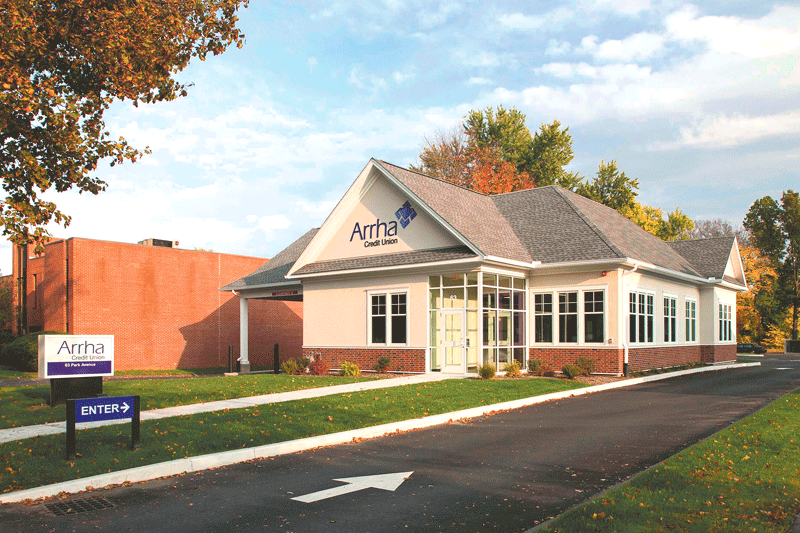 Among the many projects in the Caolo & Bieniek portfolio are the new UMass Police facility, top, and the new Arrha Credit Union branch in West Springfield. The firms have collectively done a considerable amount of work for UMass Amherst, for example — the new police headquarters there is another example — and Westfield State University, where projects include a residence hall, classroom spaces, and the Eli Campus Center. Public-safety complexes have become another strong niche, said MacMillan, noting that experience with such structures certainly helps in the highly competitive bidding process, and it has helped the firm amass nearly a dozen such projects over the years. 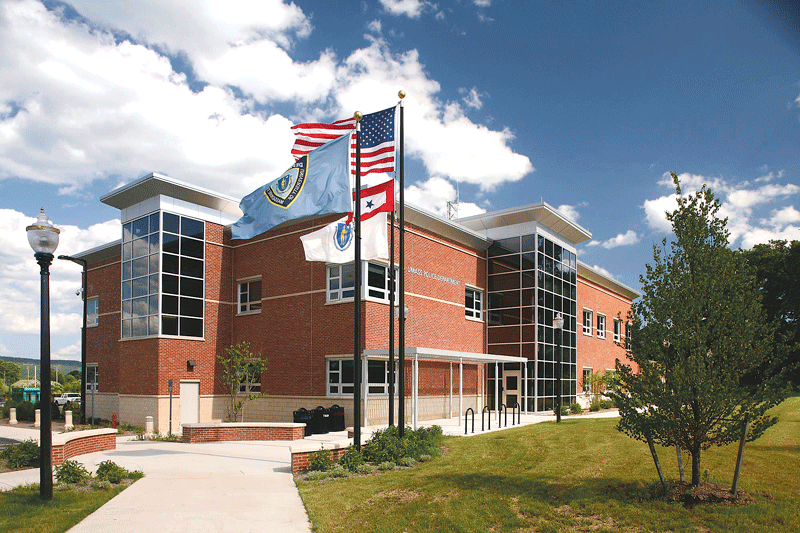 And he believes the combined experience of the firms helped CBA as it won the contract to build a new public-safety complex for the town of Westhampton. Other specialties include libraries and senior centers, he went on, adding, again, that the firms have been very similar in the composition of their portfolios, although Reinhardt would often venture out of the 413 area code — it did a lot of work on both the North and South Shores of the Bay State — while CBA stayed closer to home. The union of the companies also allows CBA to be more responsive because it can bring more resources to bear, said Edgin, adding that this is another important trait within a market that has become, in a word, more demanding. Architects use numbers and images in their work, but, as Edgin noted, this is a relationship-driven business, where people make all the difference. But ‘horsepower’ is a term that works, well, because it has a number of definitions, in this case the ability to offer valuable resources and experiences in efforts to serve the client. And through this union of two former competitors, a larger firm can bring considerably more horsepower to bear.